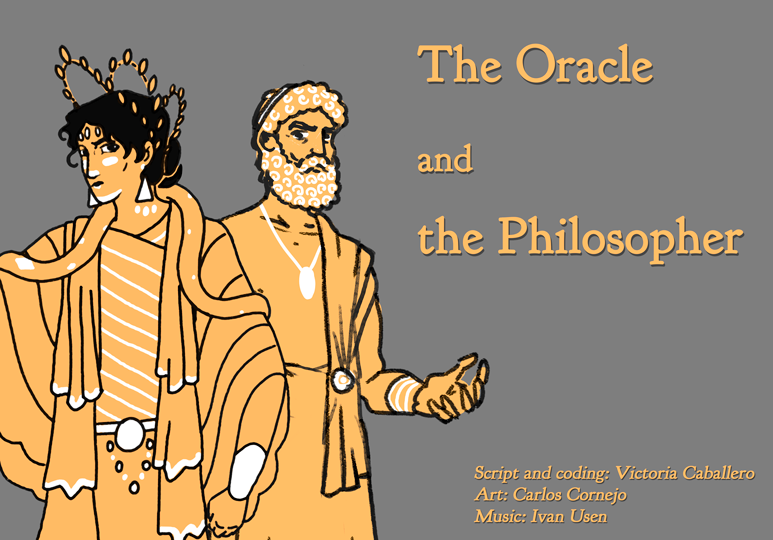 Hesperides, a philosopher in Delphis, loses his lover during a storm, trying to leave the city because of the oracle’s prophecy. Hurt, he comes back to confront the oracle and make everyone see that she only tells lies. When she tells another prophecy, Hesperides promises the people that he will prove her prophecies can be broken and beings an adventure of his own. Nice writing, art and music. A very complete game with multiple endings. The parts that rhyme are awesome. Awesome entry overall. I really liked the ambient in the game, regarding art, music and scripting of course. Very worked and polished entry here! Love the multiple-choices and the three endings. Great scripting work!